December 18, 2017, 12:31 PM · In an effort to promote the coverage of live violin performance, Violinist.com each week presents links to reviews of notable concerts and recitals around the world. Benjamin Beilman performed the Barber with the Scottish Chamber Orchestra. The Scotsman: "Technically he seemed to revel in his own immaculate, strongly projected playing, with articulation so sharply etched it was uncanny, especially in the fiendish figurations of the Concerto’s fiery finale. But it was the sophistication of his insights into Barber’s Concerto that impressed the most: he dug deep into the troubled first movement, for example, to convey unflinchingly its turbulent drama and melancholy. His vibrato was exceptionally wide and pronounced, especially in a slow movement of otherwise noble restraint, but that was in keeping with the Concerto’s golden age origins – and entirely absent from the lightly tripping, period-flavoured Bach Gavotte that he played as a forcefully demanded encore. He’s a remarkable talent, delivering playing of rare insight and generosity, as captivating as it is gloriously entertaining." The Herald: "Barber’s Violin Concerto spends much of its time looking back to that era, and only really steps into the soundworld of the 20th century in the last movement. 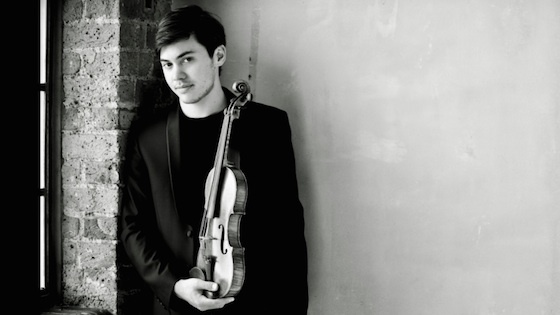 Young violinist Benjamin Beilman explored that narrative with commanding authority, making light work its technical demands." Baiba Skride performed the Korngold with the Royal Scottish National Orchestra. Edinburgh Guide: "Throughout its three movements the soloist was very much on her own with, as the programme notes describes it, relentless virtuosity. Baiba Skride gave us a delightfully jaunty performance." The Herald: "A player of exemplary clarity and precision, that is never at the expense of emotion, even in the most demanding passages." Esther Yoo performed the Mendelssohn with the Royal Scottish National Orchestra. The Scotsman: "Esther Yoo found her best in the slow movement. The finale, mostly lustrous and articulate, almost came apart at one point. Yoo’s opening movement was generally radiant, the flow interrupted by moments where her tonal focus wavered. An exquisite Bach encore was her salvation. The Herald: "Violinist Esther Yoo was completely at home with the orchestra as she performed Mendelssohn’s violin concerto with tight dexterity and balanced grace and a tone which was lean yet strong, deliberate yet gentle. Her cadenzas sparkled, with seriously impressive ornamentation and silkily subtle double-stopping, though it was her dialogue with the orchestra which really showcased her command of the music." December 19, 2017 at 04:50 AM · "fiendish figurations of the ... fiery finale." Wow.